Digicel is the Key to your $150,000 Fortuneâ has announced its fourth winner: Euann London of Richmond Hill. âI am going to put the money in my account for future use as I canât think of anything that I need right now,â London said. 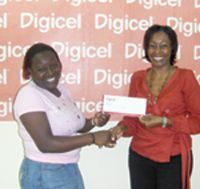 She went on to say that Digicel is the best and she is patiently looking and waiting to get a âCâ to win $1000 and hopefully the grand prize of $150,000 in January 2007. Euann London is the second member of her family to be rewarded by Digicel, earlier this year her aunt Lucian London won herself a trip for two to Miami to experience Miami carnival. Someone will walk away with $150,000 at the conclusion of the competition this Christmas season. Every customer who tops up their account or fully pays their bill on time will get a chance to win by simply collecting the letters on the cards until they spell the word DIGICEL to enter the draw to win the grand prize. Those who Top Up using vouchers should also collect their vouchers and spell out the word DIGICEL. All Postpaid customers who pay their bills on time will be automatically entered into the draw. Along the way to the ultimate fortune, persons can win weekly prizes. Each week a lucky customer will win $500 until the final draw with a grand prize of $150,000.